The History of the Indian Warfare including details of the attitude towards war, the weapons used and the methods of war which were adopted by many different Native Indian tribes. The use of War Paint was important to Indian warfare. Warpaint had spiritual and protective significance but was also used to terrify and intimidate enemies. The achievements and victories of warriors were often reflected in the symbolic images of their war paint. Interesting facts and information about the attitude of Native Americans towards Indian warfare and the methods adopted when entering into a dangerous conflict situation. The adjacent picture is interesting as it depicts the use of camouflage which was also used in Indian Warfare. The phrase 'Indian Warfare' conjures up fierce, intimidating, merciless fighters seemingly invulnerable to fear or intimidation and prepared to fight to the death using deadly weapons and blood thirsty tactics to achieve honor and victory. Valor in battle, demonstrated through the killing of enemies, was a primary means of social advancement in Indian tribes. Whilst this is true, the purpose in conducting Indian warfare was, as everywhere, to inflict as much harm upon the enemy, and to receive as little as possible. Most conflicts and battles fought during Indian warfare were of a relatively short duration. 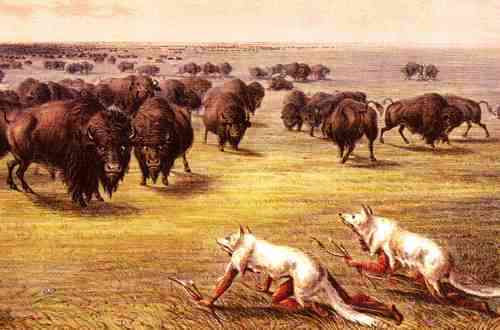 The Battle of the Little Bighorn was fought, and won, in less than an hour. Although many Indian tribes had war-like tendencies Indian warfare was not undertaken lightly, lives were at stake and men had to ensure that their families had enough food to survive. The subject of Indian warfare covers many elements including the reasons for war, the causes of Indian warfare, the methods of Indian warfare and the training, weapons and preparation for embarking on any form of Indian warfare. Every male Indian wanted to prove their bravery in battle, and this was expected form their tribes. Whilst killing an enemy in battle was considered honorable, the greatest honor was bestowed upon the warriors who could get close enough to his enemy to touch him and then return to safety. This was called a coup, which meant 'war count'. A point scoring system was in place for touching an enemy with the bare hands or with a coup stick. The coups were carefully counted during warfare and war trophies were put on display such as the notches on a coup stick or by the feathers in war bonnets. Indian Horse War paint was used depicting tribal markings to indicate the number of coup counted, enemies killed and horses captured. 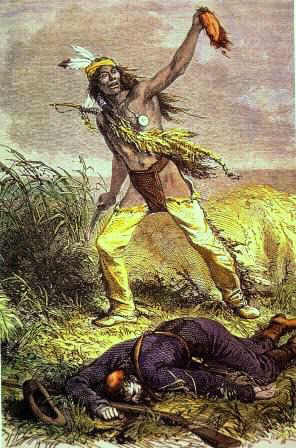 The practise of taking scalps was adopted by many Native Indian tribes. 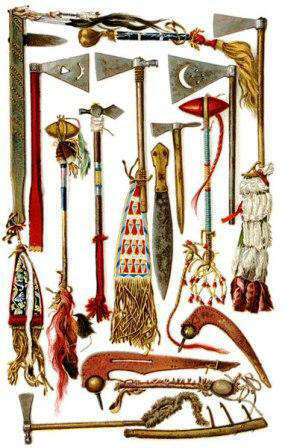 During Indian warfare the practise of many tribes was to take scalps. A scalp was cut and torn from the head of wounded or dead enemies during warfare. It was carefully cleaned and stretched on a hoop and was mounted on a stick for carrying. The skin was painted red on the inside, and the hair arranged naturally. If the dead man was a brave wearing war feathers, these were also mounted on the hoop with the scalp. Contrary to popular belief the highest honour was accorded not to the warrior who secured the scalp, but to the warrior who struck the first blow upon the enemy - referred to as counting coup. To expose oneself to the dangers of such an act was the epitome of bravery to the Native American Indian. Indian Warfare. Discover the key years, famous people and events of the Indian Warfare together with the causes and effects of the war, conflict and battle. Pictures have been include wherever possible which show the battlefield, clothing and weapons of the Native Indian tribes and their leaders who fought in the Indian Warfare. The illustrated text provides a really useful educational resource for kids and children of all ages. We have included pictures and videos to accompany the main topic of this section - The Indian Warfare. The videos enable fast access to the images, paintings and pictures together with the information and the many facts featured on this subject of the Indian Warfare.